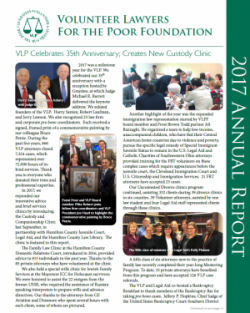 Check Out The Volunteer Lawyers for The Poor Foundation’s 2017 Annual Report! Thank you to all the private attorneys who took cases pro bono for the Volunteer Lawyers Project, volunteered at the Family Law Clinic at Hamilton County Domestic Relations Court or the new Custody and Companionship Clinic at Hamilton County Juvenile Court. Your time and expertise made a difference to 3,445 low-income individuals in our community. Check out the Volunteer Lawyer’s Project latest achievements by clicking below.